The Web has attracted a great deal of attention in recent years–perhaps significantly, in the influential business press and popular culture. Uniform Resource Locators (URLs) appear in many advertisements, and Business Week devotes a page to listing the URLs of its advertisers. Reporting on the Web is currently fascinating to general readers and listing URLs is helpful to consumers. However, systematic research is required to reveal the true nature of commerce on the Web. This is true particularly from the perspective of the Web in marketing communication, and especially so for the Web as an advertising medium or tool. In this chapter, we provide a brief overview of the Web as a phenomenon of the late 20th century; then we explore the Web as an advertising medium, using established theoretical models of consumer and industrial buying behavior; finally, we develop a model of Web conversion efficiency–its power to move the customer from being a passive Internet surfer to an interactive user of the medium. Cyberspace, or to give it its less clichéd name, the Internet (the net ), is a new medium based on broadcasting and publishing. However, unlike traditional broadcast media, it facilitates two-way communication between actors; unlike most personal selling (telemarketing being the obvious exception), it is not physically face to face, but neither is it time-bound. The medium possesses interactivity–it has the facility for individuals and organizations to communicate directly with one another regardless of distance or time. The Web has introduced a much broader audience to the net. Furthermore, it allows anyone (organization or individual) to have a 24-hour-a-day presence on the Internet. The Web is not a transient phenomenon. It warrants serious attention by business practitioners. Statistics support this, although one astute observer recommends strongly that all estimates be made in pencil only, as the growth is so rapid. No communication medium or electronic technology, not even fax or personal computers, has ever grown as quickly. While most academics and practitioners might be starting to think about, and even acknowledge, the importance of a Web site as a marketing communication tool, to date little systematic research has been conducted into the nature and effectiveness of this medium. Most of the work done so far has been of a descriptive nature–“what the medium is,” using such surrogate measures as the size of the Web audience to indicate its potential. While these endeavors might add to our general understanding, they do not address more specific issues of concern, such as the communication objectives that advertisers might have, and how they expect Web sites to achieve these objectives. Neither do these studies assess the effectiveness of this new medium from the perspective of the recipient of the message (the buyer , to use the broadest marketing term). The Web is rather like a cross between an electronic trade show and a community flea market. As an electronic trade show , it can be thought of as a giant international exhibition hall where potential buyers can enter at will and visit prospective sellers. Like a trade show, they may do this passively, by simply wandering around, enjoying the sights and sounds, pausing to pick up a pamphlet or brochure here, and a sticker, key ring, or sample there. Alternatively, they may become vigorously interactive in their search for information and want-satisfaction, by talking to fellow attendees, actively seeking the booths of particular exhibitors, carefully examining products, soliciting richer information, and even engaging in sales transactions with the exhibitor. The basic ingredients are still the same. As a flea market , it possesses the fundamental characteristics of openness, informality, and interactivity, a combination of a community and a marketplace or marketspace. A flea market is an alternative forum that offers the consumer an additional search option, which may provide society with a model for constructing more satisfying and adaptive marketplace options. The Web has much in common with a flea market. The central and fundamental problem facing conventional trade show and flea marketers is how to convert visitors, casually strolling around the exhibition center or market, into customers at best, or leads at least. Similarly, a central dilemma confronting the Web advertiser is how to turn surfers (those who browse the Web) into interactors ( attracting the surfers to the extent that they become interested; ultimately purchasers; and, staying interactive, repeat purchasers). An excellent illustration of a Web site as electronic trade show or flea market is to be found at the site established by Security First Network Bank, which was one of the first financial services institutions to offer full-service banking on the Internet. The company uses the graphic metaphor of a conventional bank to communicate and interact with potential and existing customers, including an electronic inquiries desk, electronic brochures for general information, and electronic tellers to deal with routine transactions. Thus, the degree of interaction is dependent on the individual surfer–those merely interested can take an electronic stroll through the bank, while those desiring more information can find it. Customers can interact to whatever degree they wish–transfer funds, make payments, write electronic checks, talk with electronic tellers (where they are always first in line), and see the electronic bank manager for additional requests, complaints, and general feedback. We have taken the notion of trade shows as a marketing communication tool and extended it to the possible role of the Web site as an advertising medium. This is speculated upon, in the context of both the buying and selling process stages, and in both industrial and consumer contexts, in See Exhibit 1. The relative (to mass advertising and personal selling) communication effectiveness of a Web site is questioned graphically in See Buying and selling and Web marketing communication, although without prior quantitative data, it is mere conjecture at this stage to posit a profile. By simply placing a question mark between mass advertising and personal selling in the figure, we tempt the reader to contemplate the communication profile of the Web. Industrial buying can be thought of as the series of stages in the first column in See Buying and selling and Web marketing communication. The buyer’s information needs differ at each stage, as do the tasks of the marketing communicator. In column 2, a model of the steps in the consumer decision making process for complex purchases is shown, and it will be seen that these overlap the steps in the buying phases model to a considerable extent. The tasks that confront the advertiser and the seller in both industrial and consumer markets can similarly be mapped against these stages, through a series of communication objectives . This is shown in column 3. Each of these objectives requires different communication tasks of the seller, and these are similarly outlined in column 4. So, for example, generating awareness of a new product might be most effectively achieved through broadcast advertising, while closing a sale would best be achieved face to face, in a selling transaction. Most marketers, in both consumer and business-to-business markets, employ a mix of communication tools to achieve various objectives in the marketing communication process, judiciously combining advertising and personal selling. 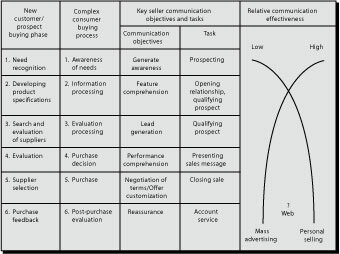 The relative cost-effectiveness of advertising and personal selling in performing marketing communication tasks depends on the stage of the buying process, with personal selling becoming more cost effective the closer the buyer gets to the latter phases in the purchasing sequence–this is shown in column 5. A central question then is where does a Web site fit in terms of communication effectiveness? Again, rather than profile this, we leave it to the reader. At this point, we re-emphasize the fact that the Web is still in its infancy, which means that no identifiable attempts have so far appeared in scholarly journals that methodically clarify its anticipated role and performance. This deficiency probably stems from the fact that few organizations or individuals have even begun to spell out their objectives in operating a Web site, let alone quantified them. This is not entirely unexpected–unlike expenditure on broadcast advertising, or the long-term financial commitment to a sales force, the establishment of a Web site is a relatively inexpensive venture, from which retraction is easy and rapid. It is not unlikely that many advertisers are on the Web simply because it is relatively quick and easy, and because they fear that the consequences of not having a presence will outweigh whatever might be the outcomes of a hastily ill-conceived presence. This lack of clear and quantified objectives, understanding, and the absence of a unified framework for evaluating performance, have compelled decision makers to rely on intuition, imitation, and advertising experience when conceptualizing, developing, designing, and implementing Web sites. These two concerns–the lack of clear or consistent objectives and the relationship of those objectives to the variables under the control of the firm–are the issues that engage us here. We propose a more direct assessment of Web site performance using multiple indices such that differing Web site objectives can be directly translated into appropriate performance measures. We then explicitly link these performance measures to tactical variables under the control of the firm and present a conceptual framework to relate several of the most frequently mentioned objectives of Web site participation to measures of performance associated with Web site traffic flow. Finally, we develop a set of models linking the tactical variables to six performance measures that Web advertisers and marketers can use to measure the effectiveness and performance against objectives of a Web site. Finally, we discuss normative implications and suggest areas for further development. gain access to previously unknown or inaccessible buying influences. Cathay Pacific Airlines uses a Web site to interview frequent international airline flyers, and determine their preferences with regard to airline, destination, airport, and even aircraft. Much of the active ticket purchasing is not normally done by these individuals, but by a secretary or personal assistant acting on their behalf. project a favorable corporate image. Guinness allows surfers to download from its Web site its latest television commercial, which can then be used as a screen saver. While the advertiser has not made the objectives of this strategy public, conceivably the approach builds affinity with the corporate brand as fun involvement, while the screen saver provides a constant reminder of the advertising message. provide product information. Many business schools are now using their Web sites to provide information on MBA and executive programs–indeed, there is now even an award to the business school judged to have the most effective Web site in North America. Similarly, Honda uses its Web site to give very detailed information about its latest models. Not only can the surfer download video footage and sound about the latest Honda cars, but by clicking the mouse on directional arrows, can get different visual perspectives of the vehicles, both from outside and inside the car. generate qualified leads for salespeople. The South African life assurance company SANLAM uses its Web site to identify customer queries, and if needed, can direct sales advisers to these. handle customer complaints, queries, and suggestions. Software developers such as Silverplatter are using their Web sites as a venue for customers to voice complaints and offer suggestions about the product. While this allows customers a facility to let off steam, it also allows the marketer to appear open to communication, and perhaps more importantly, to identify and rectify commonly occurring problems speedily. allows customers access to its system through its Web site. FedEx’s surprisingly popular site allows customers to track their shipments traveling through the system by typing in the package receipt number. “The Web is one of the best customer relationship tools ever,” according to a FedEx manager. serve as an electronic couponing device. A company called E-Coupon.com targets college students, because they possess two important characteristics–they are generally very computer literate and also need to save money. The site features lists of participating campus merchants, including music stores, coffee houses, and pharmacies. Students click on shop names to get a printable picture of a coupon on their computer screen, which they can take to shops for discounts or free samples; in return, they fill out a demographic profile and answer questions about product use. In summary, different organizations may have different advertising and marketing objectives for establishing and maintaining a Web presence. One organization might wish to use the Web as a means of introducing itself and its new products to a potentially wide, international audience. Its objectives could be to create corporate and product awareness and inform the market. In this instance, the Web site can be used to expedite the buyer’s progress down phases 1 and 2 in See Buying and selling and Web marketing communication. On the other hand, if the surfer knows the firm and its products, then the net dialogue can be used to propel this customer down to the lower phases in the buying progression. Another firm may be advertising and marketing well-known existing products, and its Web site objectives could be to solicit feedback from current customers as well as inform new customers. Thus, Web sites can be used to move customers and prospects through successive phases of the buying process. They do this by first attracting surfers, making contact with interested surfers (among those attracted), qualifying/converting a portion of the interested contacts into interactive customers, and keeping these interactive customers interactive. Different tactical variables, both directly related to the Web site as well as to other elements of the marketing communication mix, will have a particular impact at different phases of this conversion process: For example, hot links (electronic links which connect a particular site to other relevant and related sites) may be critical in attracting surfers. However, once attracted, it may be the level of interactivity on the site that will be critical to making these surfers interactive. This kind of flow process is analogous to that for the adoption of new packaged goods (market share of a brand = proportion aware x proportion of new buyers given awareness x repeat purchasing rate given awareness and trial) and in organizational buying (the probability of choice is conditional on variables such as awareness, meeting specifications, and preference). Based on the above, we model the flow of surfer activity on a Web site as a six-stage process, which is shown in Exhibit 2. The variables and measures shown in Exhibit 2 are defined in Exhibit 3.
those not interested (1- η 0). The attractiveness of having a Web site for the organization depends on Q0η0, the number of potentially interested surfers on the Web (where Q0 is the net size measured in terms of surfers). The first stage of the model represents the flow of surfers on the net to land on the firm’s Web site, and it is acknowledged that only a fraction of the aware surfers (Q0η0) visits a firm’s Web site. This describes the awareness efficiency (η0) of the Web site. The awareness efficiency measures how effectively the organization is able to make surfers aware of its Web site. Advertisers and marketers can employ reasonably common and well-known awareness-generating techniques to affect this, such as including the Web site address in all advertising and publicity, on product packaging and other corporate communication materials, such as letterheads, business cards, and brochures. The second stage of the model concerns attempts to get aware surfers to find the Web site. We distinguish between active and passive information seekers. Active seekers (Q1a) are those who intentionally seek to hit the Web site, whereas passive seekers (Q1b) are those aware surfers whose primary purpose in surfing was not necessarily to hit the Web site. Only a fraction of the aware surfers visit the firm’s Web site. The second stage of the model thus represents the locatability/attractability efficiency (η1) of the Web site. This measures how effectively the organization is able to convert aware surfers into Web site hits, either by facilitating active seeking behavior (surfers who actively look for the Web site), or by attracting passive seekers (not actively looking for the Web site, but not against finding it). where hits refers to the number of surfers who alight on the Web site. At this stage, it should be apparent that there is a difference between a hit and a visit . Merely hitting or landing on a site does not mean that the surfer did anything with the information to be found there–the surfer might simply hit and move on. A visit, as compared to a hit, implies greater interaction between the surfer and the Web page. It may mean spending appreciable time (i.e., > x minutes) reading the page. Alternatively, it could be completing a form or querying a database. Although the operational definition of a visit is to some extent dependent on the content and detail on the page, the overriding distinctive feature of a visit is some interaction between the surfer and the Web page. establish a dialogue (at the simplest level, this may be signing an electronic visitors’ book; at higher levels, this may entail e-mail requests for information). The visitors’ book at the Robert Mondavi Wineries’ Web site not only allows visitors to complete a questionnaire and thus receive very attractive promotional material, including a recipe brochure, it also allows the more inquisitive visitor to ask specific questions by e-mail. 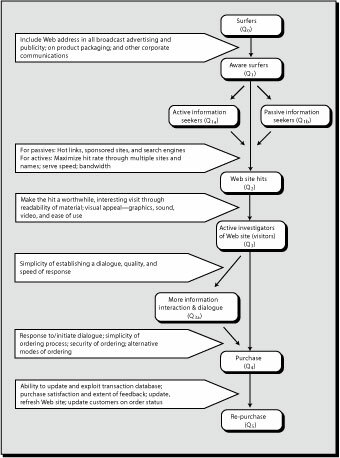 It is important to note that it is feasible to establish the dialogue in a way that elicits quite detailed information from the visitor–for example, by offering the visitor the opportunity to participate in a competition in exchange for information in the form of an electronic survey, or by promising a reward for interaction (the recipe booklet in the preceding example). place an order. This may be facilitated by ensuring simplicity of the ordering process, providing a secure means of payment, as well as options on mode of payment (e.g., credit card, check, electronic transfer of funds). Alternative ordering methods might also be provided (e.g., telephone, e-mail, or a postal order form that can be downloaded and printed). For example, the electronic music store CDnow offers a huge variety of CDs and other items such as tapes and video cassettes. It provides visitors with thousands of reviews from the well-respected All-Music Guide as well as thousands of artists’ biographies. A powerful program built into the site allows a search for recordings by artist, title, and key words. It also tells about an artist’s musical influences and lists other performers in the same genre. Each name is hotlinked so that a mouse click connects the visitor to even more information. CDnow’s seemingly endless layers of sub-directories makes it easy and fun to get lost in a world of information, education, and entertainment–precisely the ingredients for inducing flow through the model. More importantly, from a measurability perspective, the site converts some of its many visitors to buyers. regular updating and exploiting of the transaction database. Once captured, customer data becomes a strategic asset, which can be used to further refine and retarget electronic marketing efforts. This can take a number of forms: customers can be reminded electronically to repurchase (e.g., an e-mail to a customer to have a car serviced); customers can be invited to collaborate with the marketer (e.g., loyal customers can be rewarded for referrals by supplying the e-mail addresses of friends or colleagues who may be leads). Finally, we define a sixth, or overall average Web site efficiency index ( ηAv ), which can be thought of as a summary of the process outlined in See Buying and selling and Web marketing communication . where μi is the weighting accorded to each of the five efficiency indices in the model. So, for example, some advertisers might regard visits to the Web site as a very important criterion of its success (objective), without wishing or expecting these visits to necessarily result directly in sales. Other advertisers and marketers might want the visit to result in dialogue, which could result in sales, but only indirectly–mailing or faxing further information, accepting a free product sample, or requesting a sales call. Another group of Web advertisers might wish to emphasize retention efficiency. They would want to use the Web as a medium for establishing dialogue with existing customers and facilitating routine reordering. It would therefore be useful for advertisers and marketers wishing to establish overall Web efficiency to be able to weight Web objectives in terms of their relative importance. The previously developed model assumes that all hits are counted. However, there are hits that are never detected by a Web server because pages can be read from a cache memory rather than the server. A cache is temporary memory designed to speed up access to a data source. In the case of the Web, pages previously retrieved may be stored on the disk (the cache in this case) of the personal computer running the browser. Thus, when a person is flipping back and forth between previously retrieved pages, the browser retrieves the required pages from the local disk rather than the remote server. The use of a cache speeds up retrieval, reduces network traffic, and decreases the load on the server. As a consequence, however, data collected by a Web server undercount hits. The extent of undercounting depends on the form of caching. Netscape, one of the most popular browsers, offers three levels of caching: once per session, always, and never . In terms of undercounting, the worst situation is never , which implies that if the page is in cache, the browser will not retrieve a new version from the server. This also means the customer could be viewing a page that could be months out of date. Always means the browser always checks to ensure that the latest version is about to be displayed. A hit will not be recorded if the page in the cache is the current version. The default for Netscape, once per session , results in undercounting but does mean the customer is reading current information, unless that page changes during the session. The existence of a proxy server can further exacerbate undercounting. A proxy server is essentially a cache memory for a group of users (e.g., department, organization, or even country). Requests from a browser to a Web server are first routed to a proxy server, which keeps a copy of pages it has retrieved and distributed to the browsers attached to it. When any browser served by the proxy issues a request for a page, the proxy server will return the page if it is already in its memory rather than retrieve the page from the original server. For instance, a company could operate a proxy server to improve response time for company personnel. Although dozens of people within the organization may reference a particular Web page, the originating server may score one hit per day for the company because of the intervening proxy server. To further complicate matters, there can be layers of proxy servers, and one page retrieved from the original Web server may end up being seen by thousands of people within a nation. Clearly, the proliferation of proxy servers, which is likely to happen as the Web extends, will result in severe undercounting. The use of cache memory or proxy servers will result in undercounting of hits (Q2) and active visitors (Q3). Consequently, the locatability/attractability index ( η1) will be underestimated since Q2 is the numerator in the index’s equation, and the conversion efficiency index (η3) will be overestimated as Q3 is in the denominator. It is more difficult to conjecture the effect on the contact efficiency index (η2). One possibility is that the index is underestimated because active visitors browse the site more frequently than those who just hit, and as a result are more likely to read the page from cache memory. Clearly, empirical research is required to estimate correction factors for η1, η2, and η3. Unfortunately, these correction factors are likely to differ by page and change over time as the distribution of proxy servers changes. Therefore, the initial perception that the Web enables the ready calculation of efficiency measures needs to be tempered by the recognition that cache memory can distort the situation. The counting problem caused by caching is not unlike other counting problems encountered by advertisers. Viewership, listenership, and readership of conventional media are cases in point. The issue of readership, for example, has perplexed advertisers, researchers, and publishers for many years: How does one measure readership? Is it merely circulation? Circulation probably undercounts in one way, because there may be more than one reader (e.g., two people read the subscription to Wired ), or overcounts in another (e.g., no one reads the subscription). We thus believe that caching is a new variation of the same old counting problem, and creative managers will need to discover innovative ways to solve it. A fundamental problem in researching the effectiveness of marketing mix variables, such as pricing strategy or advertising, is that of isolating them from others. This is compounded further when the effects of a variable can be indirect, or have a prolonged lag effect. Cases in point are advertising’s ability to create awareness, which might or might not lead to an immediate sale, and its lag effects–consumers remember slogans long after campaigns have ended, and the effects of this on sales continue to intrigue researchers. Thus, advertisers and marketers sustain their efforts in searching for ways in which returns to marketing investments generally, and communication capital in particular, can be enhanced. This highlights the importance of establishing specific communication objectives for Web sites, and for identifying measurable means of determining the success of Web ventures. There is perhaps some solace to be gained from realizing that the Web is a lot more measurable than many other marketing communication efforts, with feedback being relatively quick, if not immediate. The Web is a new medium which is characterized by ease of entry, relatively low set-up costs, globalness, time independence, and interactivity. As such, it represents a remarkable new opportunity for advertisers and marketers to communicate with new and existing markets in a very integrated way. Many advertisers will use it to achieve hitherto undreamed-of success; for others, it will be an opportunity lost and a damp squib. We hope that the process model for assessing Web site efficiency will achieve more of the former condition. From an academic perspective, the model can be used to develop research propositions concerning the maximization of Web site efficiency, and using data from real Web sites, to test these propositions. For the practitioner, the model provides a sequence of productivity measures which can be calibrated with relative ease. The challenges facing both parties, however, is to maximize the creativity that will justify advertising and marketing investments in a Web presence. Roos, J., M. Lissack, and D. Oliver. 1998. Bringing the Internet to the masses: America Online Inc. (AOL). Lausanne, Switzerland: IMD. ECCH 398-184-1. Christiaanse, E., J. Been, and T. van Diepen. 1997. KLM Cargo “bringing worlds together” Breukelen, Netherlands: Nijenrode University. ECCH 397-067-1. Gopalakrishna, S., and G. L. Lilien. 1995. A three-stage model of industrial trade show performance. Marketing Science 14 (1):22-42. Rayport, Jeffrey F., and John J. Sviokla. 1994. Managing in marketspace. Harvard Business Review 72 (6):141-150. Sherry, J. F. 1990. A sociocultural analysis of a midwestern American flea market. Journal of Consumer Research 17 (1):13-30. Promotion and purchase: Measuring effectiveness by Pierre Berthon (Bentley College, USA) is licensed under a Creative Commons Attribution 4.0 International License, except where otherwise noted.